Your career is likely to take up a large amount of time. A “traditional” job often accounts for eight hours of your day, which means that you spend up to 1/3 of your life with your career. When you think about how much time you spend with your career, it makes sense to consider a career that you are likely to enjoy — or at least tolerate. I remember watching Office Space years ago and chuckling at the conversations about what to do with a million dollars. You talk about what you would do if you didn’t have to work. The first thing you should ask yourself is what you like to do, and pinpoint some of your interests. The reality is that you can’t always do exactly what you want when it comes to your career, but you can examine what you like to do, and look for something that might be compatible with some of your interests and preferences. Start with what you like to do, and figure out if there is a way to take that and turn it into a career – or incorporate it a little bit into your work life. Sometimes, it helps to start with what you are good at. It might not be exactly what you are looking for, but if you are good at it, it might make a good career choice. In some cases, knowing that you are good at what you do is its own reward (other than the money, of course). Take stock of your skills, and recognize that it can make sense to consider your talents and abilities as you choose a career path. In some cases, what you’re good at may also coincide with what you enjoy. If this isn’t the case, you can look to enjoy some aspects of the work, or, if you enjoy something that you aren’t good at, you can attempt to learn to become proficient. In any case, being able to do something well is a good start in a career. 3. Is There a Demand for My Skill Set? One of the hardest lessons I learned when I began writing is that not everyone wants what I’m offering. Look at your skill set, and see if there is a demand for it. There are always positions for people with marketable skills. Make it a point to develop marketable skills, or to figure out a niche in which you can use your skills. I eventually had to give up my dreams of writing on certain topics — at least writing on them for money. Instead, I gravitated toward finance-related topics. It turned out to be a great choice, and I still get to write (which I love), and I’ve learned a how to adapt my skills to a marketable niche. If you don’t have marketable skills, make it a point to discover what is marketable. If you can line that up with your preferences and talents, so much the better. 4. Do I Have Much Choice? In some cases, you might feel backed against a wall. There are times when you just don’t have a choice with your career. You need the job and the money, so you take it. But that doesn’t mean you have to stay there. Ask yourself if there is a way to change the equation, and develop new skills and abilities, and you can create more choices for yourself. 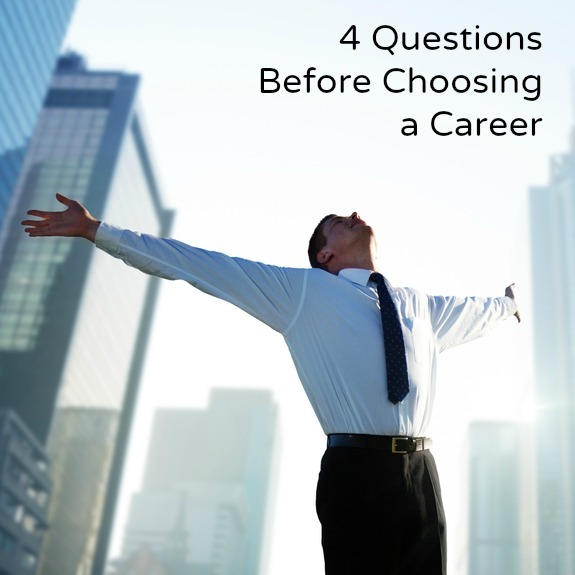 What career path are you considering? Leave a comment! I’am 58 year of age and over 20 year’s of Binlingual Customer Service & Retail Sales Experience. My last job was as Operation Manager and before that I was Car asst Sales Manager in Florida.and rigth now can not find a job.How can you do to help me a find vs.younger person.It’Not bing easy for mi.I’ve bing in the market since 10/15/13 and Nothing! Please I Need You’r Help. Please reply. Thank You.